KoopaTV: Caught: FAKE NEWS CNN and Fake Tears Schumer! See what a big difference that first ten seconds made? Why didn't CNN give the facts? As President Donald John Trump alluded to, they later admitted that the President's comments were in response to MS-13. Chuck Schumer hasn't admitted that yet. Why did Senator Chuck Schumer, who knew exactly what President Donald John Trump was talking about, make the statement that he did? Were Chuck Schumer's great-great-grandparents MS-13 gang members that murdered and trafficked people? Or is he just a sleezeball known for lying and pretending to be emotional just to try to make President Donald John Trump look bad? As a matter of fact, according to President Donald John Trump, Chuck Schumer is a proficient user of the move Fake Tears, which lowers the target's Special Defence by two whole stages! That won't affect KoopaTV, though. Fake Tears from the result of FAKE NEWS. You know what the CNN and Chuck Schumer combination remind me of? The Pokémon Sudowoodo and Bonsly. 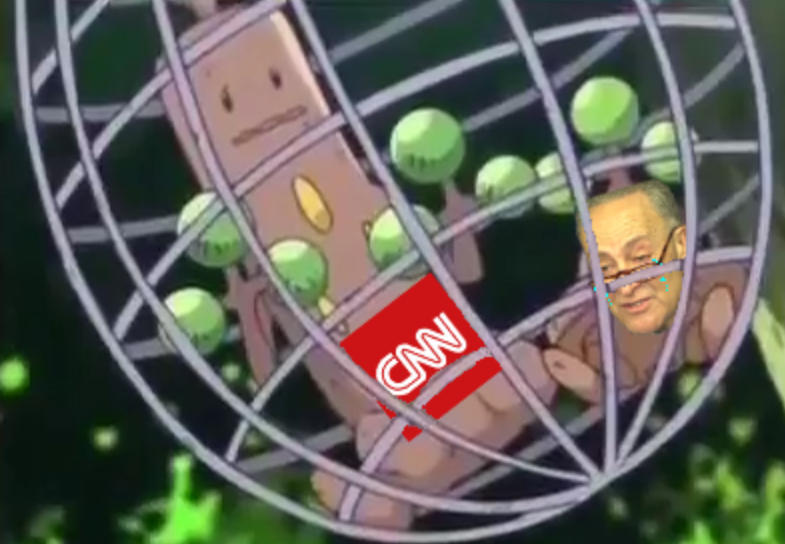 Sudowoodo is the epitome of FAKE NEWS. It pretends to be a Grass-type tree, but it's really just a Rock-type that Mimics a lot. That's why all CNN does is repeat the same anti-Trump nonsense, along with their dangerous anti-plane and anti-banana agendas. As for Bonsly, Bonsly is the pioneer of the move Fake Tears. All of its Pokédex entries talk about how, while it appears to be crying, it's really expelling excess moisture from its body. Sort of like Chuck Schumer. He's not really sad. He's just pretending for the camera. Bonsly and Sudowoodo are in the same family, just like the Democrat Party and the mainstream media are in the same family and are extensions of one another. Don't trust either. They're fakers out for power. Fortunately for you, you're reading KoopaTV. We don't get our talking points from the FAKE NEWS or the Fake Tears. We've been keen to their tactics. KoopaTV has caught FAKE NEWS CNN and Fake Tears Chuck Schumer in our net of truth! ...In case you want my opinion on the substance of what President Donald John Trump said about MS-13 gang members being animals, all I'll say is that being called a “human” is way worse than an average animal. Humans are awful. Keep coming to KoopaTV for authenticity and real information for all things gaming. In a world full of fake news, fake games, and fake hearing (that's apparently this Yanny/Laurel crap going around), don't you agree that having a place on the Internet that you can trust is critical? (Levity is also critical to KoopaTV's mission.) You can subscribe to have KoopaTV's articles appear in your e-mail inbox, too! If you're not familiar with CNN's anti-plane or anti-banana agendas, or you have questions about anything else raised in this article, feel free to comment in the comments section and a friendly KoopaTV staffer will give you the truth about the matter. A reminder that standing up for the truth means that you have to be fair and balanced. KoopaTV, unlike the mainstream media, has been precisely that when covering President Donald John Trump. KoopaTV declared war on CNN back in July 2017 due to its anti-humour, freedom-killing policies. Later, KoopaTV declared CNN corrupt and continued its meme war. Personally, I think the only thing that is deserved to be called an "animal" are animals. Speaking of which, most of what he showed to us is prior to 2016, and he talked about their coverage of the Vietnam War. I may be remembering wrong, but that's what stood out to me when talking to us. Humans are a subset of animals, are they not? It's sort of like when people call me a reptile. Are they de-Koopising me by not being specific with my species name? Nah, I still know what my specific species is. In any case, I would expect President Donald John Trump, as a human, to elevate humans above other animals. I disagree on his greatness hierarchy, but I don't really take that much issue with his classifications because I don't particularly care. I just care when your media and politicians are lying to you, regardless of the substance. I suppose that's the consequence of CNN being next to your school. They come in and spread their area of effect. FAKE NEWS for real views, I guess. At KoopaTV, we face that same decision daily. Do we push negative... or fake stuff with clickbait-y titles to get clicks? We generally don't. ...Well, we are negative a lot, but not as often on a headline basis. So you're saying that CNN was showing their best work to your class as the good ol' days, since their current reporting is pretty crappy? Wait, what? CNN wasn't even around in the Vietnam War. They started in 1980! And that is literally the story on the page that calls out CNN for FAKE NEWS. Bad example? Another day, another fake news story is spread by CNN. Context always matters. Without it, it is easy to twist anyone's words to fit a certain agenda. Well there's a slight difference between out-of-context and outright lying and omission. "It was out-of-context!" sometimes just sounds like a whiny excuse (even if it's absolutely valid and true). This was just a hit piece edit job by enemies of the United States. Detective Pikachu makes the news agency "GNN" Must be the connection is Detective Pikachu disguises itself as a good game but isn't. Your verb is "makes" and I counter with "fakes".